Welcome to our third open preview of Update 21.3. These notes are for Bullroarer, released on Friday November 10th. Both the notes and the update are a work in progress, so you should expect things will change over time. We look forward to hearing your feedback and receiving your bug reports. The server is expected to remain available through noon (server time) Tuesday 11/14. Please feel free to copy your current live character to Bullroarer using the LIVE transfer wizard. Any characters created or copied over the last two weekends remain intact. Please remember that deleting a character will not allow you to re-copy from live worlds. Please join us this weekend and provide feedback on The Abyss of Mordath Raid. The first boss fight is now complete and difficulty / balance feedback on tier 1 and tier 2 would be greatly appreciated. The second boss is present but does yet have all of the final fight mechanics implemented. Reward chests are hooked up for both bosses and we would love your feedback on the new chest time locks and Fellowship Tradeable tech. After defeating the second boss in The Abyss of Mordath, the door will not open to allow you to proceed beyond that point in the raid. 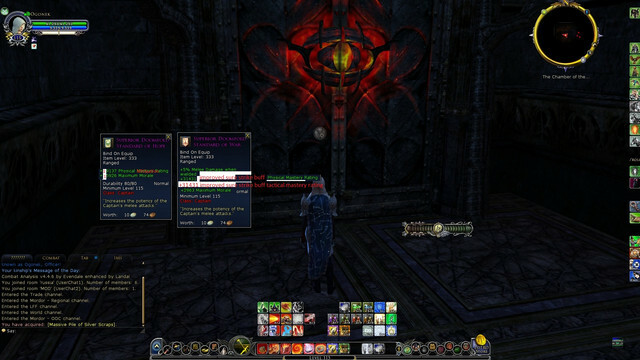 For testing purposes only The Abyss of Mordath chests have been set to a daily, rather than weekly, lock. On test worlds only, copies of the first and second boss chests have been placed near the start of the raid. This will allow you to experiment with the new raid lock mechanics... you may choose to loot these early chest copies, at which point you should be unable to loot the same chests again (either there or after boss defeat) until after the lock resets. Chest locks should be visible with the player "/raid locks" command. Daily repeatable quests allow immediate repetition of the quest. Instance chests can now drop items that are "Fellowship Tradeable". These items can be freely traded amongst fellowship / raid members that were present in the instance space when the chest was created, until the Fellowship Tradeable timer expires. These items will list a "Item binds in:" timer in their tooltip. These items cannot be mailed or auctioned. These items cannot be stacked until the Fellowship Tradeable timer expires. Currently only The Abyss of Mordath chests use this new tech. Preview only - In order to test the functionality of the system, this Bullroarer build includes a higher currency cap (10,000) on Ash of Gorgoroth in addition to having Ash automatically go into the Barter Wallet. This functionality is still being assessed. The respawn timers on the Haunted Burrow Poorly Hidden Chest, Out-of-Place Strongbox, Out-of-Place Lockbox, and Out-of-Place Chest have been halved. Dungeons of Naerband - A new chest has been added for players who make it out of the Dungeons of Flame section of the Instance. The loot in this chest is currently placeholder. Dungeons of Naerband - Thraknûl's Chains of Malice attack includes an induction and different effect icon. Dungeons of Naerband - Damage done by the anti-healing debuffs has been reduced. Dungeons of Naerband - Fewer trash mobs will spawn between the first and second boss fights. Additionally, area-of-effect damage from Thraknûl and the Flame-spirits has been further reduced. Dungeons of Naerband - Thraknûl is more resistant to unintentionally resetting when being kited. Kite cosmetic pets will now settle at a lower height when you are indoors. A variety of landscape bugs were fixed including rock texture missing in Lhingris, a stuck spot in the Ruins of Barad-dur, a floating pillar in Udun, an area in Dum Boha that was tagged as part of Mordor rather than as part of the Wastes, a bridge in Dum Boha that you could fall through, floating resource nodes in various areas, and an unintentional underwater slag pile hidey hole. Sighterseer's Trousers will no longer change color based on the dye applied to your chest piece. You can no longer disenchant items if you do not have room for the resulting Ash of Gorgoroth. Some gloves and helmets available at the skirmish camps, as well as cosmetic rune-keeper satchels are no longer invisible on High-elf characters. Mounts - Steed of Agarnaith now offers 68% move speed and 250 Morale, an improvement from its previous stats. Preview only - Mount collection deeds will no longer show both the horse and pony verions of the steed skills. Preview only - Stained glass housing decorations are now visible from both sides. Eyes & Guard tavern - Dust requested a make-over. She no longer looks like a swirling dust cloud. To enter the new Raid, you will need to Discover the Abyss of Mordath. Find the door in the Chamber of the Watchers in the lower levels of Barad-dur (Western edge of the Barad-dur map on the lower corridor branching). Abyss of Mordath - For testing purposes, the quests that allow you to bypass a boss that you have already defeated have been set to daily rather than weekly reset. Note that this is a new mechanic to allow for a new, less prohibitive, style of raid locks. The raid group will be able to skip past the the bosses defeated by the first member of the party to cross the line at the beginning of the instance. Preview - PvMP: Many Monster Player stats and attributes have been adjusted as a start to achieving better balance in the Ettenmoors and Osgiliath. THIS WORK IS NOT DONE and we welcome continued feedback! The npc "Dust" in the Eyes & Guard tavern stairwell offers a quest that rewards Ash of Gorgoroth. Eyes & Guard tavern: Vastin's Mordor Relics T1 box now has Rare and Incomparable Vanguard Runes of Force, Healing, and Power. Preview - Eyes & Guard: 'Cursed' gear in the "Mordor I <armour type> Abyssal" & "Mordor I <armour type> Wyrm" boxes available from Vastin has been replaced with non-cursed pieces. Ransroth in the tavern now has 'Mordor - Conquest of Gorgoroth' reputation quests. Karst in the tavern now completes the Throne of the Dread Terror deeds and grants Throne of the Dread Terror tokens. Rock in the tavern basement now has quests for Silver Signets of the Thandrim and North Ithilien barter items. Dungeons of Naerband - Voice over and dialogue text was added to major Boss attacks. Dialogue text has been added to Orc and Uruk mobs for some of their attacks. Dungeons of Naerband - The door to Thraknûl's area should reset more reliably when the fight resets. North Ithilien Essences are now bound to account by default. Missing farming ingredients were added to some Crafting Suppliers. Steed of the Moon Moth naming inconsistencies are cleaned up. The mount collections that previously granted titles have been replaced with deeds. To advance one of the mount collection deeds, you must use that mount skill (from the mount collections panel or from skill panel, mounts tab.) New mount collection deeds/titles have also been added for the 2015 & 2016 Festival steeds, Goat mounts, and Gondor mounts! The 2017 Festival Steed deed has been added. Lore-master Class Items "Book of Beasts", class items at level 20, level 30, and level 40, now give minor bonuses to pet stats. Skills - Lore-master - Inner Flame - Duration halved from 10s to 5s. Fire Damage buff increases at an accelerated pace to compensate. Healing increased. Tier 10 Captain Armaments may now be bartered for exchange receipts. Crafting - Universal Ingredient Packs may now be used on select Westemnet Guild Recipes. Crafting - Certain Jeweller recipes which did not allow you to inscribe critical outputs now allow it. Crafting - Westemnet and Doomfold Captain Armaments now provide significantly more armour to heralds. Crafting - The Anorien Expertise Token may now be consumed in a recipe also available from skirmish barterers. The stable travel route to the First Hall should now drop you off in the correct spot in front of the stable master. The first door in The Court of Seregost can now be opened in combat (but remains locked during the boss fight) to prevent players from getting stuck inside. 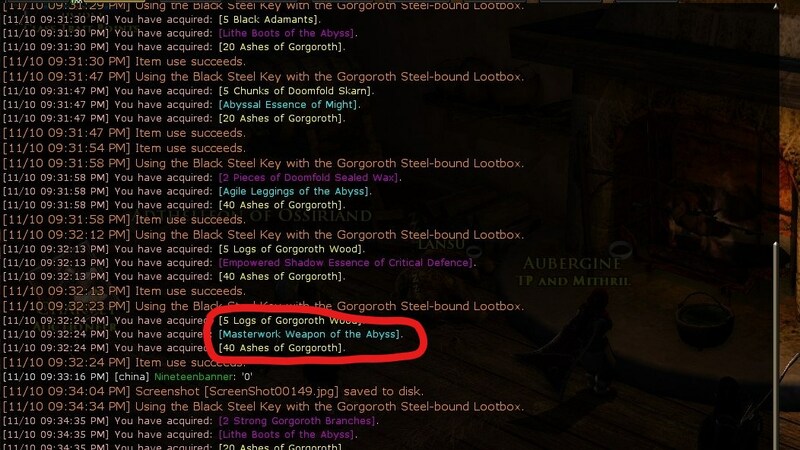 The quest "Lost Lore of Gorgoroth: Agarnaith" now rewards the correct reputation. Players who have logged out in the Vales of Anduin may be sent to Archet upon logging in. This is because the absolute location of the Beorning starting area has been moved. Other than this possible teleport, you should notice no difference in the Vales of Anduin. Equipment - Level 105 Featured Instance Armour sets will once again be item level 222. Crafting - Fragments of Gorgoroth Dungeons will have the proper plural name when stacked. Instance: A Trap for the Creature should no longer break when using the flat stone too soon. The Court of Seregost: Black Númenórean-slayer deed now indicates how many need to be defeated. The Lossarnach quest "The Smoke Lures" no longer requires Orcs to be defeated. Recent mounts such as Steed of Elessar's Host, Sunflower Steed, Rescued Steed of Agarnaith, Goat of the Harvest Sky, and Steed of Eldar Autumn have been added to the Mounts Collection display. The Lossoth Steed and Steed of the Dusk-watch now have correct source information in the Mounts Collection panel. The Skeleton Steed Rider Bundle can now be used (opened) even if you already have the Riding trait. Minor performance improvements were made to the loading of the mounts collection page. Please let us know if you notice anything failing to load properly. The Quartermaster "Conquest of Gorgoroth Rewards" now carries a slate of new housing items including statues, stained glass, and decorative flower garlands. The character panel no longer hides equipped items that are in the loot filter. The cat wander sequence plays smoothly now. When a quest is filtered but underway, characters can still interact, advance, and turn in the quest. Players should no longer see a Free Hobbit Present button immediately following the redemption of a free present. To fix an issue that could prevent their use, the Poorly Hidden Chest, Out-of-Place Strongbox, Out-of-Place Lockbox, and Out-of-Place Chest in the haunted burrow will now disappear and respawn after each opening. Gorgoroth Scourge Spoils boxes no longer include Gondor Silver Pieces or Anórien Sealed Wax. Dungeons of Naerband - Some monster skills were adjusted to affect Lore-master pets and Captain heralds. Rare spawns have been added in Agarnaith and Dor Amarth. This allows Hidden Threats of Gorgoroth to be able to be completed. Captain Skills - Dropping power cost from motivating speech and improved motivating speech. Items - Took in the Hole Hobnanigans recipe now properly provides +5% incoming healing. Lore-master pets and Captain soldiers were collecting mobs from a greater area of landscape than desired. Their aggro radius has been halved. Collections panel model views are now slightly bigger. Various small bug fixes for Ilex branches spawned in tree, the exit to Boffin Manor, two patrons in a Bree auction house are sitting on nothing, an invisible water volume, Ralthat's awkwardly positioned shield, floating planks of wood, a floating bush, an oddly misshapen rock formation, and an npc floating over bench. The quest bestowal UI in German should now correctly fit the indicators for solo, small fellowship, fellowship, and raid quests. Portions of Agarnaith should no longer be overrun with limitless cave claws. 'Daily Request: An Errand for Frodo' has been restructured. Now the random spawns of Imprisoned Nurnhoth in Naerband have been replaced with static spawns, and should be a less frustrating experience. 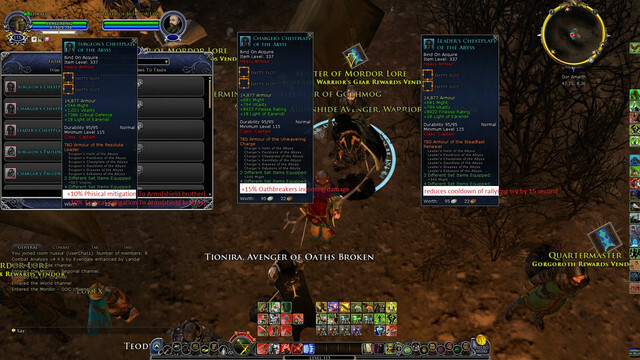 Additional quest guide info has been added to Mordor quests: The Caretaker, Treasures Forgotten. During the quest 'Stolen Supplies' Viznak and the Ranger will no longer occasionally disappear before you can interact with them. Inn League members should once again be able to obtain the Inn League Notable and Senior Inn League Member deeds/titles. Minor texture adjustments have been made to the Autumn Leafmail Dress to address the dark skirt underlayer. The background image for the credits has been updated and the credits music updated to 'Ever On'. All Gorgoroth leg armour pieces now have the correct light or medium armour values for their weight. Corrected the icon for Mordor's Bane and Expedition's Vanguard leg armour. Last edited by Tybur; Nov 10 2017 at 08:13 PM. but please just rework the landscape loot system instead of doing this in the long term. And if you hesitate making landscape loot fair, then at least stop giving any interesting loot in landscape at all and stop repeating the same mistake for future updates... interesting landscape loot that got farmed to death with farmraids happened since Rohan... Time to learn from mistakes or people see intentions - bad ones. Besides that... many interesting fixes... Mordor gets more and more interesting. Cant wait getting in there in "winter" (or sooner if there is a bundle without valar or just blackfriday sale for half the price :P). Every single gear item from the raid is available to ash barter ! The only difference is that ash gear doesn't award set bonuses. Jewells are 100% the same. This doesn't even happen in the worst pay to win chinese MMO on the whole planet. Tybur, have any additional changes been made between this Beta and last week's? I spent a lot of work running numbers last week, and I'd prefer to not do it again if it's unnecessary. Welcome to our third open preview of Update 21.3. We look forward to hearing your feedback and receiving your bug reports. The server is expected to remain available through noon (server time) Tuesday 11/14. Well here is my feedback on this. It's utter rubbish. To not be able to play an MMO RPG that while leveling the mobs drop the gear You can use while leveling is rubbish. You can not do Allegiance quests until 115 to get the keys and open boxes. Not that that would help as thats for 115 gear anyway. 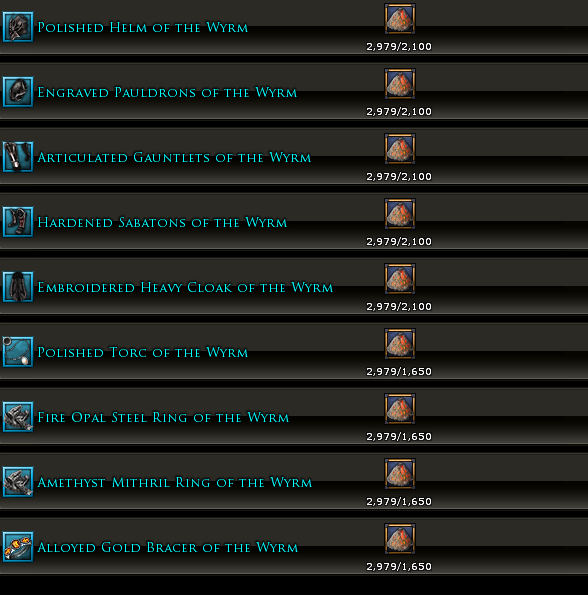 You can not craft other than 115 LoE gear. Basically this is just to try and push sales for lootbox keys and not even considering the effect this will have on players while leveling from 106 to 115 that needs the Radiance, sorry I mean LoE on their gear. I have not participated in any of the Ash farms and now those of us who didn't are punished and can't even get the occasional drop while out questing and killing mobs. It also creates a huge gap in the playerbase between those who took this time to farm and those of us who didn't farm. If this is to increase key sales and stop farming well then all it does is send the signal that those that did farm as much as possible after launch did the right thing and those of us who didn't well screw us I guess. That was my feedback on those 2 points. Last edited by Lord.Funk; Nov 10 2017 at 08:21 PM. No PvMP changes have been made between this week and last week. Vastin is still going through all of the wonderful feedback provided (and welcomes more) and hopes to make additional adjustments next week. Feedback with real concrete numbers is so helpful (honestly essential) for any kind of balance work, so thank you! I applaud your efforts of driving people to the store to buy keys for gear. Perfect, thank you for the info! I hope you redo the quest rewards as well. Players already have problems getting enough LOE to go into the higher areas. Now you make it even harder. Where are landscape players suppose to get LoE gear to go into higher shadow areas. And please don't refer to the ash recipe. That requires way to many shards and only gives 10 ash. While you are at it remove the ash in instances below 115 as well. That would just be fair. Where exactly can players get ash in landscape? You know there will be a whole set of new players entering Mordor after U22. Are they supposed to stay in lower areas to get to 115 to finally be able to gear to be able to do the last 2 zones? Are you nerfing landscape? What are your plans to assure smooth transitions to higher shadow areas? I thought you wanted to offer gear for ALL playstyles? Each time after bad update when I recover little will i have left for playing you relase another bad update.Seems like your goal is to drive away anyone who is still playing.Still not a single word from dev about class balance but lets remove ash drop on landscape.Very fast to fix that but not so fast on class balance.No worries I will go buy 1000 keys.... guess we are off to another few months break if you even survive that long with kind of content you keep releasing.I just cant understand how how the fk can you be this clueless about game you are making fking hell.Good luck to those who stay playing. Not sure what would be worse... But I think it would be worse giving it to people for ash later after some others had to fight for it and do some DKP or whatever ####. So having it available from start does seem like a better option in my opinion or you would have the same situation as having better jewellery available from picking flowers than by raiding. And I do agree about gear drops from landscape... The gear is very much needed for people who are leveling. Especially if they are leveling for the first time. Raid gear shouldn't be available for ash upon logging in. At the very least, it should be deed gated. Are you kidding me? How are we supposed to get ash gear? Even your lootboxes only give 20 and I get 1 every other day from dailies. I will not be able to gear my toons in a decent time, it's bad enough now. Ash drop rate is abysmal unless you spend 24 hours farming seregost or open 200 lootboxes. I want to run the instances and play but when stuff is broken/bugged you can't run it and it takes so long to scrap together decent gear, it's not worth it. Plus having to regear every month it feels like. Thanks you are making my decision to cancel my sub and not spend any more money feel like it was the right thing to do. Already the world responds to the updates on no ash drops. From 4 pages of black steel keys on the AH on brandywine this morning to 2 items early this evening. Let the hoarding begin! Isn't capitalism grand! I hope at least that the teal drops are replaced with purples and not totally useless items. Maybe raid gear should have it's own currency only obtainable in the raid. Tyber - As I can't craft shields at the new tier and have been unlucky with getting a barter item for a decent shield from (your metrics can tell me how many I've opened) lootboxes my last hope was to join an ash farm for the first ever time in the hope of an incomparable level 110 Heavy Shield drop. But this option seems to be closing on me. If you could point me to a quest in Mordor that gets me a Heavy Shield better than the two level 106 ones I have now it would help some. Failing that can you provide me with the percentage chance that I have to get a Silver or Gold (inexplicably bound) Signet from a Gorgoroth Lootbox? Or to give me some idea how many different items are in the Gorgoroth Lootbox loot table as the more stuff added I have no interest in the less my chances of getting something I want is and the more chance I have of giving up on the lootboxes lottery. Maybe you could list all the "prizes" like any shady operator would be obliged to do. OR give the metalsmiths some shield recipes for goodness sake. These new players are the ones who complained about the crazy xpac pricing and value and refused to pay up so SSG are teaching them a lesson. However many have been farming ash the last 3 months so is not a problem, only those with some dignity and didn't "exploit" in ash farms will pay the price. Look at that - a t2 raid offhand, out of a lootbox. Chest & Leggings are not available via Ash Barter. I have zero issue with non-raiders obtaining this gear w/o set bonus or identical jewels at a high ash cost. At this stage, it's pretty clear that SSG are targeting the casual gamer market and looking to generate revenue wherever possible (raid offhand in loot boxes...). Raiders, like myself will ultimately look to farm for the set bonuses and if we can get stuff such as jewels without paying the insanely high ash cost, then naturally that will be our preferred path. Last edited by Knight.Arkenstone; Nov 11 2017 at 12:01 AM. "Level 106 - 115 landscape mobs will no longer have a chance to drop incomparable equipment that can be disenchanted into Ash of Gorgoroth"
That is certainly not the only reason why we want these to drop in landscape. The only reason I made it through early Mordor was that teal armor had been dropping in Durthang when I was lvl 107 and needed it to survive. Until you can afford and use lvl 112 gear you have to rely on landscape drops. Please, please don't remove these! RAID GEAR with bonus sets is available for ashes and also drops in lootboxes? 1. Set bonuses from raid gear need to be better across the board. Sorry but rapid fire to 70seconds from 90seconds doesn't cut it. Keep the old set bonuses like you're doing for rk and lm, they're fine the way they were honestly. This will keep the incentive for people to keep running t2 raid. 2. Gate the ashable raid drops. A t1 raid clear should be required for people to get the ash gear. 3. Ok, fine, get rid of the incomparable landscape drops. But if you're going to do that, at least make purple and yellow gear drop from landscape mobs. This will allow gearing for mordor. And while we're at it, please make light essences craft-able. The fact that they're not is preposterous given that LoE is the single greatest mitigating factor to mordor progress. Removing random gear drop from mobs....Are you for real ? I stopped my sub last spring, because I couldn't keep up with the flowers/essences/solvents grind. I came back for mordor last month only to find out the grind was even worse than before, but still doable for people with no life (OR MONEY). And now you're trying to make it even harder, especially for casual players. How are we supposed to get gear while questing in mordor without the random drops ? Did you forget about the light of earendil system you've just introduced ? Things are supposed to get easier in mmorpgs in term of grind x months after a new update. You're doing things in reverse, preventing players from catching up. I get it, money keep the game alive, but how about listening to the playerbase ? And stop this PtW nonsense. Gear shouldn't drop for lootboxes, especially t2 items.